Tutorial for use with Quilt Assistant, written by Regina Grewe, also available in German on her website. Let's assume you want to make a quilt out of hexagons and you are looking for a design and color scheme, that is a bit different from the traditional flower-based motifs. 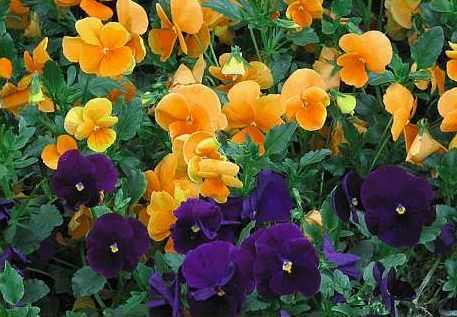 Let's also assume that you have a photo in which the colors and arrangement are particularly pleasing. 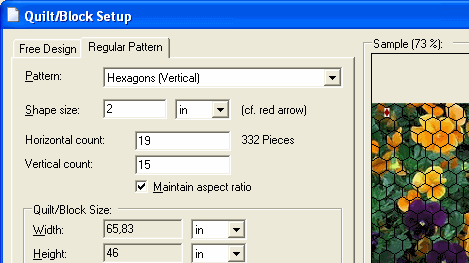 Start the Quilt Assistant – as described in the tutorial on printing templates – and choose hexagons. Click on "Browse..." and a window will appear where can you choose a photo file, in the usual Windows-way. On the top-right you can choose the function "Thumbnails" and you can make the window itself bigger to make it easier to find the photo you are looking for. Nature and flower photos often have beatiful colors, but it could also be an image of a paintung oder a Hundertwasser-building. Or make a detail cut of an image, that contains nice color combinations. With "Open" you will return to QA. Click OK and the workplace will show you a complete color design! Don't forget to save! 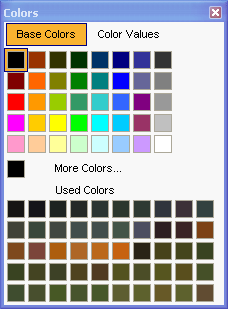 The program is now in the "Color" mode and shows a separate color window. You can increase its size so you can see all of the colors used. At this time there are probably too many colors to find in your fabric stash. Go to "Edit - Reduce Number of Colors" and choose a more realistic number. Now you can further change the remaining colors and/or redistribute them. More on that subject in the next lesson, or experiment for yourself! To print templates see this tutorial. Have fun playing with colors! In the next tutorial we will look at the color window and its features in more detail.